Liverpool legend Robbie Fowler says he wants to manage a team in the UAE and going on the current rate of sackings, the former striker might get his chance sooner rather than later. The 43-year-old has already had one spell in overseas football, managing Muangthong United in the Thai League 1 in 2011-12. “I feel as those I’ve got a lot to offer the game,” he continued, “I feel as if I’m knowledgeable. In fact I don’t feel as if I’m knowledgeable, I know I’m knowledgeable. “I’ve got a lot to give to the game. That’s why I went away and done my Pro-license because I wanted people to maybe take me serious. And if that owner happened to be in the UAE…? “Without a shadow (of a doubt),” Fowler confirmed. “I’ve been going to Dubai in the UAE for over 20 years now and I don’t claim to know everything about the game (in the UAE) but I have seen games. “And I’ve seen how passionate some people are about football, whether its experts or even Emiratis. They can get behind the game when they want to. “I do like the football over there, I really do. And if it means me becoming a manager and being given that option in Dubai or anywhere in the UAE, I’d love a stab at that, I’d love a chance at that. “If that what it takes for me to become a manager then I’m all for it. Fowler would certainly find himself at home with other stars who have excelled in the English game, such as former Crystal Palace star Yohan Cabaye and former Manchester City striker Alvaro Negredo, now plying their trade with Al Nasr. “That’s what you want,” agreed Fowler, “any league in any part (of the world), as long as you’ve got players who are coming there and you’ve got people who are supporting the league, it gives that chance for the league to grow. Talking of managers he admired he mentioned three bosses he played under during his many years at Liverpool. “I’ve been quite lucky because I’ve played under all different levels of management,” said Fowler, “I loved Roy Evans because his man- management was superb. “Technically and tactically he probably wasn’t as good as a Rafa (Benitez) or Gerard Houllier. Roy would probably forgive me for that. 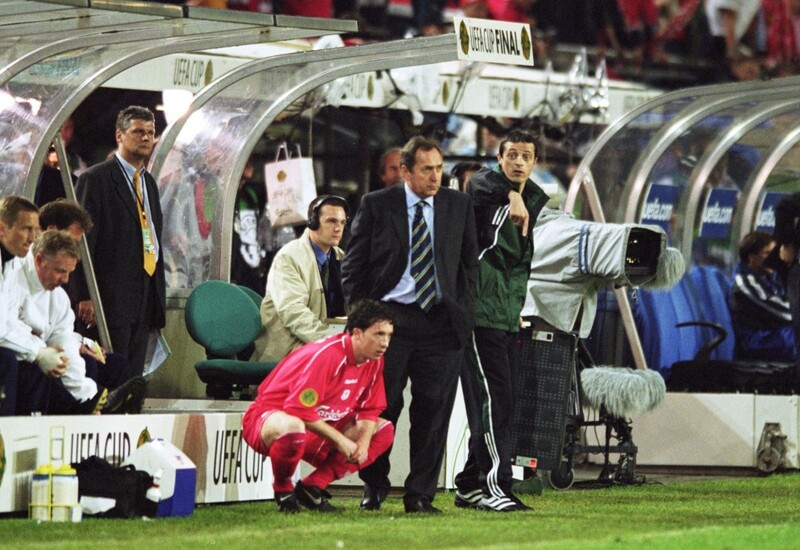 “But Rafa and Gerard Houllier, their attention to detail was incredible, it really was. “It’s easy for me to say I want to take everything (but) I love the man-management side of it. I think if you’re a great man-manager you can bring out the very best of players. “I think obviously you need to be knowledgeable, you need to know the technical side of the age now, but it’s also important you get the good team (support staff) around you as well so you’ve got every angle covered in terms of football. “So I would prefer to go down the great man management route as well as doing the technical side as I think that is probably the way forward. 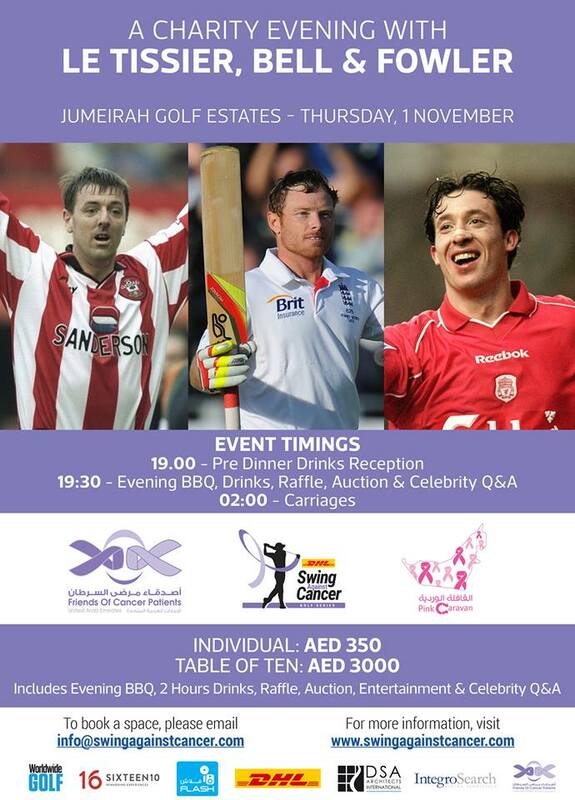 Fowler is in the UAE to support the DHL Swing Against Cancer Series, at Jumeirah Golf Estates on Thursday November 1, along with another former football great Matt Le Tissier and England cricket star, Ian Bell. It’s a cause that he feels very passionate about. “I think anyone in any walk of life, whether it’s a friend or a person within the family, whose been involved with cancer,” explained Fowler, whose own family has been effected more than once. “Sadly it’s a horrible disease and people all over the world have lost family and friends because of this disease. If you’d like to join Robbie at the DHL Swing Against Cancer Series on November 1 Golf and Dinner only spaces are still available. Just email [email protected] to book your spot. 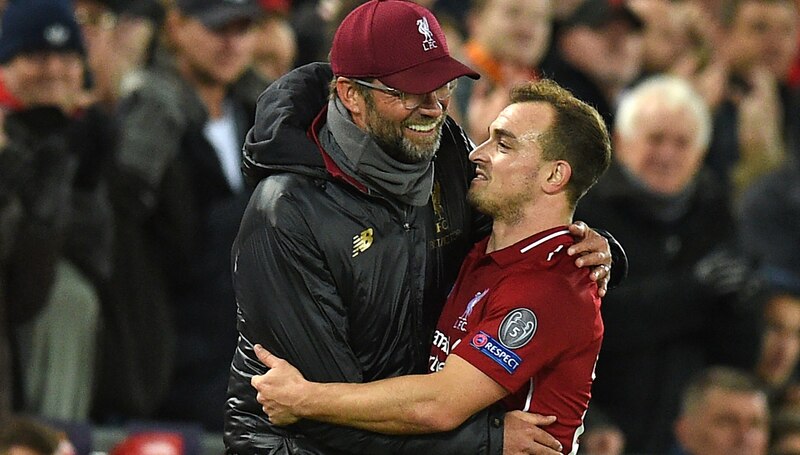 Jurgen Klopp embraces Xherdan Shaqiri after his superb performance against Red Star Belgrade. Liverpool boss Jurgen Klopp hailed the touch of ‘genius’ by Xherdan Shaqiri that helped Mohamed Salah take his club total to 50 goals in 65 games as the Reds thrashed Crvena Zvezda (Red Star Belgrade) 4-0 on Wednesday night at Anfield in the Champions League. To hear what Klopp had to say watch below. Mohamed Salah reached 50 goals for Liverpool as Jurgen Klopp’s side got their Champions League campaign back on track with a comfortable victory over Red Star Belgrade at Anfield. Defeat by Napoli last time out made this a must-win game in the battle with the Italians and Paris Saint-Germain for the qualifying spots, and Liverpool’s class told as they ran out 4-0 winners. Roberto Firmino continued his fine scoring record in the competition with the opener in the 20th minute before Salah took over, netting his first just before half-time and then scoring a penalty shortly after the break to make it 50 goals in just 65 Reds appearances. A second penalty was missed by Sadio Mane but the forward made amends moments later to net Liverpool’s fourth. Klopp stressed in his programme notes that Red Star should not be underestimated but the Serbian champions, playing in the competition proper for the first time since it became the Champions League in 1992, looked clearly the weak link in Group C.
Liverpool welcomed back Mane following his broken thumb but their injury problems persist and Virgil van Dijk captained the team in the absence of the hamstrung Jordan Henderson. Brazilian midfielder Fabinho made only his second start for the club and impressed in moments while also giving the ball away too cheaply. The early stages showcased the “average” Liverpool that Klopp referred to after they ground out victory over Huddersfield at the weekend, with passes misplaced and Red Star looking the more threatening. The home side’s opening 10 minutes was summed up by Trent Alexander-Arnold inadvertently blocking Firmino’s shot when Liverpool finally created something of note. Moments later Xherdan Shaqiri played Salah clean through but, although his first touch was good, the Egyptian dallied too long before shooting and keeper Milan Borjan blocked. After 19 minutes of little quality, a move oozing it gave Liverpool the lead. Shaqiri won the ball back in midfield and then played a tremendous pass to Andrew Robertson, who pulled it back for Firmino in the centre of goal to take a touch before drilling it in via a deflection. Red Star were banned from having any fans in the stadium because of trouble at a previous match in Salzburg, but it was barely noticeable so marginal were they as an attacking force. The goal settled Liverpool down and it was only a matter of time before they grabbed a second. Robertson probably should have been the man but he sliced woefully wide in the 43rd minute after finding himself clean through. Two minutes later the hosts did have their second, Shaqiri again the instigator with a ball through to Salah, who had once more looked rather hesitant but this time acted decisively to slam the ball into the net. If the contest was still just about alive, it was ended six minutes into the second half when Salah converted from the penalty spot. Referee Daniel Siebert took an age to decide that Filip Stojkovic’s block on Mane was worthy of a penalty, much to the annoyance of Red Star. 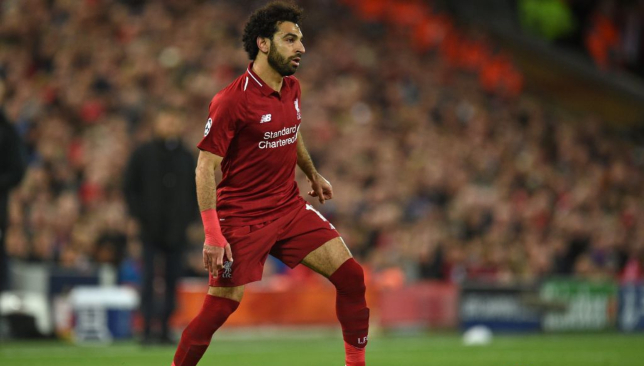 Liverpool continued to push forward, and Firmino drew a decent save from Borjan, but Klopp’s mind began to turn to Saturday’s clash with Cardiff and he withdrew both Shaqiri, who received a standing ovation, and Salah. Moments later Liverpool were awarded a second penalty for a handball by El Fardou Ben Nabouhane but Mane was denied by a superb save from Borjan and was unable to put away the rebound. Redemption arrived only four minutes later when he timed his run expertly to collect a Daniel Sturridge pass and poke the ball past Borjan.